We are expert in domestic rubbish clearances including property clearances and the removal of bulky waste. If you're moving home or office, our highly experienced team can help you to get it cleared quickly and safely. Just tell our professional team what needs to be taken away and what needs to be left and the job will be done in no time. We even remove bulky waste including furniture; we will do our best to recycle as much as we can. What we remove. Is your garden out of control? Well now it is time to tackle it with the help of TRP. We can get rid of all of your garden clutter including green waste, bushes, rubble and broken garden furniture. Our team can remove almost anything in your garden. Check out our reviews. Call us on 0800 138 9100 for a free, personalised quote for your garden clearance. Let our team make your office move that bit easier. We can solve all of your removal needs within schedule and to budget. We cover your area. We can remove any general or bulky waste including desks, office chairs, filing cabinets and computers. We offer a secure disposal service for paper files and documents. Our waste removal teams provide a regular commercial waste collection service to businesses in and around Surrey. We can collect all different types of waste which we dispose of legally and responsibly, following all Government legislation. We are committed to reusing or recycling as much waste as possible. Read about our recycling services. 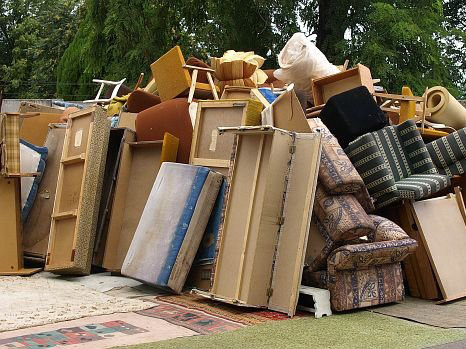 The rubbish clearance team at TRP can take away any waste clearing your site of clutter and hazards. We can remove all type of building waste and rubble from your construction site in Surrey and the surrounding areas. The Recycling People are a fully licensed and accredited waste collection and disposal company.